We’ve often wondered – where do the uber-rich stay when they travel? One thing’s for sure, they certainly don’t stay in low-rent motels and half-price B&Bs like the rest of us – places we can only afford after searching for bargains and saving for months. Oh no, we’re sure that when multi-millionaires jet from one side of the world to the other, their lodgings are far more luxurious, and complete with free French champagne and Swiss chocolates no doubt. Take London, for instance. If we were to travel to the UK’s capital, we wouldn’t be able to afford much in the way of hotel luxury. But it turns out the other half can – and usually in the form of The Ritz London as well. At least, that’s according to a recent report from New World Wealth, a company that keeps an eye on what the world’s filthy rich are up to. 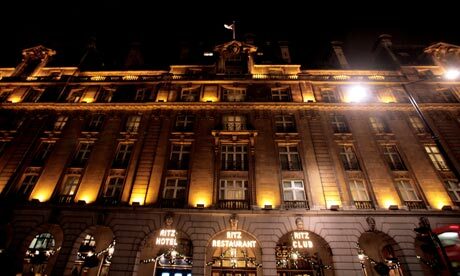 And apparently what they’re up to in London is staying at the Ritz, the hotel of choice for international multi-millionaires, followed closely by the Mandarin Oriental and Claridge’s London. We remember walking past the Ritz once. We didn’t dare go in though – we thought we might need a bank loan just to get past the doorman. That’s why when we hit the big one on the lotto, we’ll be following in the footsteps of the ultra-wealthy and staying in the Ritz too. We hear the room service is excellent – but we’ll have to try it out for ourselves first and get back to you. Something else we can’t wait to try out for ourselves is the Bellagio Hotel in Las Vegas, reportedly the most popular hotel in the world amongst multi-millionaire travellers. 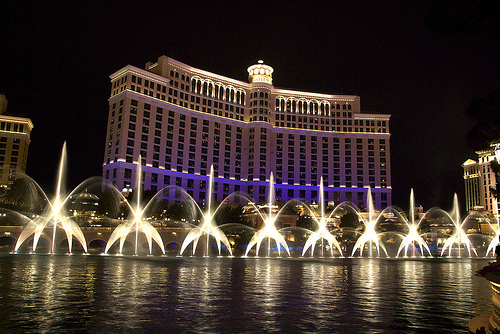 There are only two things we know about the Bellagio – it has amazing fountains, and it featured prominently in the George Clooney film Ocean’s Eleven. But with over 6,400 visits by the world’s wealthiest in just 12 months, there’s obviously more to it than that – and we plan on finding out exactly what, once we’re armed with our lotto jackpot millions of course. And it wouldn’t even take that many millions to join the ranks of the fabulously wealthy either. Apparently all you need to be classified as a multi-millionaire is a measly $10 million in the bank – and as we’re planning on playing for at least $84 million in this Friday’s Mega Millions lottery draw, we’ll reach multi-millionaire status and then some! As soon as we do, we’ll be trying out some more of the world’s most popular luxury hotels – like The Plaza in New York, the Hotel de Paris in Monaco, and the Marina Bay Sands in Singapore, all favourite hangouts of the world’s wealthy, and all soon to be playing host to us and our oodles of lottery millions. Get ready London and Las Vegas – we’ll be checking in soon. Please have our champagne on ice, our mini bar stocked with goodies, and our room service menu ready! Play the lotto today, get rich tomorrow! Giant Lottos give all of our signed up players the chance to play for cash prizes every day from several of the world's biggest online lotteries. Do you want the chance to play for the world's biggest jackpots? Then the US Powerball is the prefect lotto for you! With draws held weekly, giving away millions of dollars each draw, the US Powerball is the most significant lotto out there for a good reasonwith good reason. Mega Millions (originally called The Big Game Mega Millions) is one of the world's most well known and amazing lottery games. It's played all around 43 states in the USA, and the US Virgin Islands and the District of Columbia. It's so easy to play, and the jackpots begin at a massive $15 million.